I can’t believe how fast the time is flying by. Summer is finally here (!!!!!!!!!!!!!) and I feel like I don’t have enough weekends left to do everything I want to do before I have to go back. It’s already sad to think about, leaving Poland. I know it’s still 3 months away, but looking at the past 3 months as an example, that time will disappear so quickly. I’m trying to think of everything that’s happened the past while and it all feels like too much to remember. I haven’t Skyped with anyone in months because I’ve been incredibly busy—but with what I can’t quite recall. A while back I was gone for a few weekends in a row visiting family and then was studying for the mid-terms, which are finally all over, and I know my marks for almost all of them—passed, with varying colours ;) But I’ll start with what I do remember! Last weekend, Dorothy and I signed ourselves up for a weekend-long hiking trip, into the mountains! It was a much needed get-away. It felt so great to be in the mountains again, to breath fresh hair, to be surrounded by trees and silence, to gaze at the snow-capped mountains, to sleep in old cabins, to be challenged by a trail, to sing songs around a campfire—haven’t done most of those things since last September! It was also fun spending time with new people, getting to know them, and just the process of hiking. We hiked for 2 hours the first day, 8.5 hours on the second day (granted with breaks), and 4ish hours on the last day. And the process was an ordeal! : cautiously stepping through thin and thick snow, leaning away from the all too-near cliff sides praying your foothold doesn’t slip out from beneath you, walking through the snow run-off (that is, a stream) that found a suitable path to the bottom of the mountain (that is, our path), and manoeuvring yourself up steep slopes, grabbing onto tree branches and the snow itself to prevent yourself from falling, meanwhile not trying to think about how you’ll ever get down. The only constant thought was to just keep going forwards and up and up and up. And it was so worth it. Getting to the top is always worth it in the end. The view was stunning. The mountain, by the way, is called Babia Góra and we made it to the top on the third day. 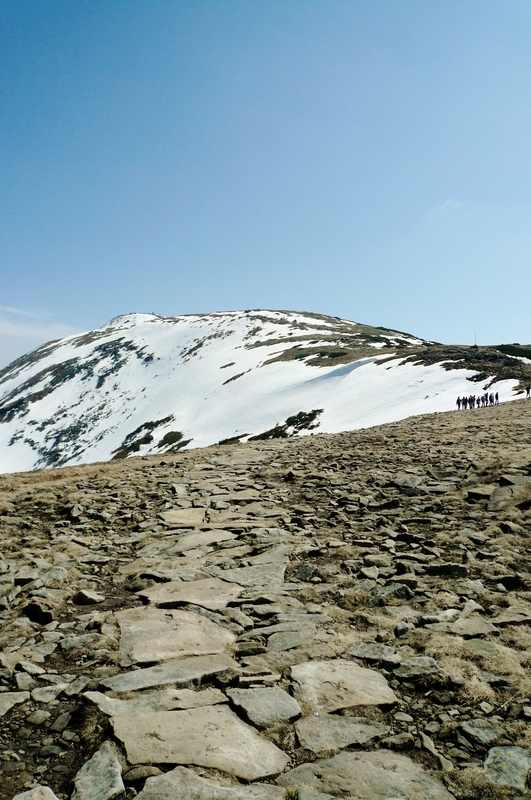 On the first two days, the mountain, of 1,725 m, seemed like this giant obstacle. We could see in the distance, sometimes when we made it to a clearing, this looming white-covered thing surrounded by a haze of clouds. To be honest, I didn’t believe them at first when they told me that was the mountain we would eventually get to. In between our starting point and it, there were quite a few hilly mountains—it just seemed ages away. But the experience was really worthwhile, climbing over and around hill after hill and seeing it a step closer. Here are some photos from the last day—I was too busy trying not to fall or slip to take many photos in the first two days. Other than that, I have been spending my time casually in bars and pubs, drinking beer after beer, some occasional shots, some occasional cake, grabbing one too many meals (pizza or a kebab) at the “local”, meeting friends of friends and new people, spending time lounging in the sun by the river, biking (I bought a bike! ), walking, sightseeing, and planning my evenings with friends. I’ve grown more and more to love the life I have here, and now with the warmth and sunshine (at last!) it doesn’t feel like it could get any better. On Sunday, I have potential plans to go to Auschwitz (finally!) if I feel like I’ll have enough time afterwards to pack, because on Monday I am flying out to Switzerland!!! Again, I can’t believe that the Swiss-trip is already here! The tickets were bought last February. Anyways, I’m not too sure of what exactly we’ll be doing, but I’ll be sure to write something up about that afterwards! I’m really excited to be seeing some more of Europe, especially a country like Switzerland! Dorothy and I are going to visit our friend Betina there, who was in Dorothy’s school three years ago in Canada on an exchange. Things will be fantastic. My only worry is wondering how I’ll work my way around the disgusting thing that is cheese…. Hope things are well with my friends back home! I know most of you guys are back in Terrace (/Prince George!) as universities in Canada are out for the summer now. It makes me a little sad that I can’t be there with you guys—if it was only possible to be in two places at once! But, I’ll catch the end of the summer with you, and though I can’t quite picture August yet, I know I’ll be happy to be home. Also, with the 9 hour time difference, it was impossible to find a time that worked. “Getting down” the steep last slope, was one of the most fun things I’ve done in a while. The steps that had been dug into the snow were so worn down by the end, it was nearly impossible to make our way down them. Among others, I took out my rain jacket, tied it around my waist, and slid down the slopes as if I was sledding. 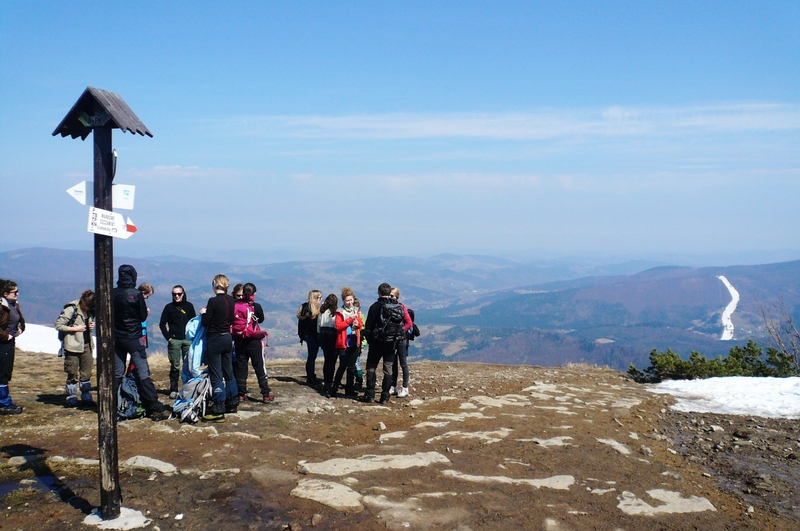 It took us almost 3 hours to get to the top of Babia Gora, and only 30 minutes to get down. You can imagine the speed :D And you all know I like high speeds. I just realized that’s not as high up as I imagined…I mean I’ve skydived from higher than that. But from the ground, it doesn’t seem that small! And you can blame her (partially) for not finding the time to blog! There are no mountains in Poland. After hearing this statement numerous times, my Aunty decided to take my sister and I and show us this was not true. 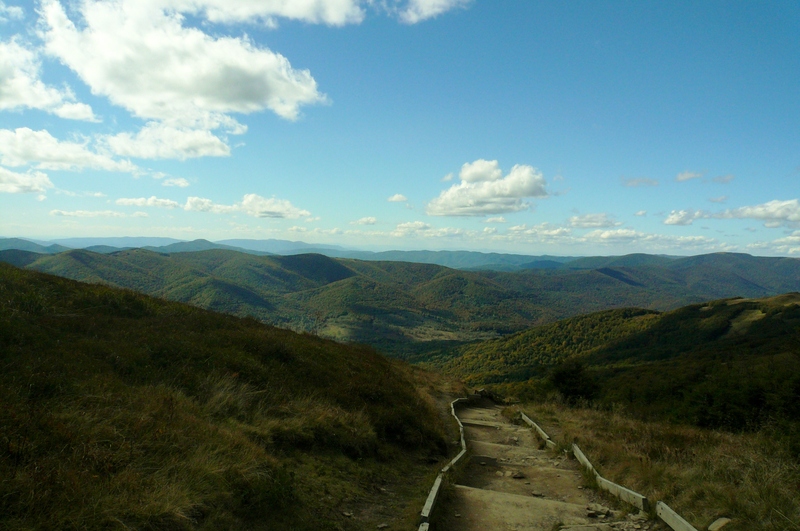 We headed for the south-eastern corner of Poland, for a mountain range known as Bieszczady, slipped between Poland, Ukraine, and Slovakia. Different and smaller than the Canadian mountains I am used to, they are one of Poland’s big attractions, being a National Park in Poland. These mountains are held close to the heart for many nature lovers, and to many people in my family. My dad, who values nature above all others I’ve met, fell in love with these mountains, so to speak. The only mountains close to home, during his university years he made many trips there with friends. I think this only made his love of nature grow, or maybe reminded him time and time again how beautiful it is. It was his get-away. 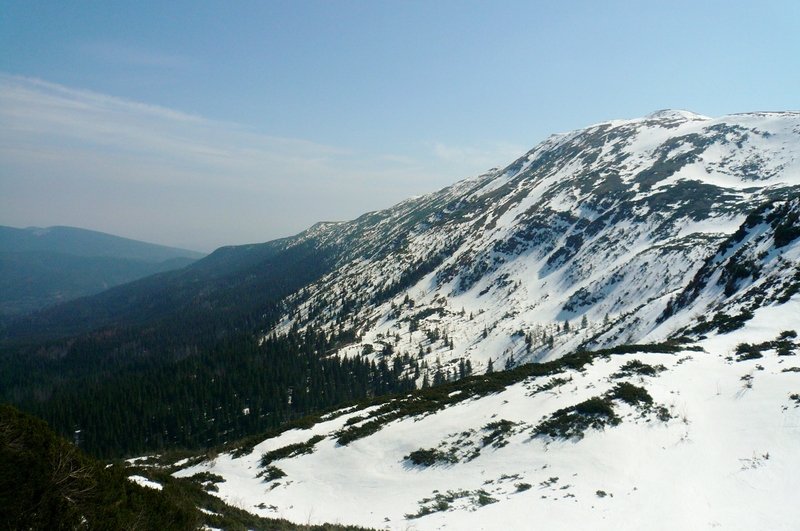 Last time he came to Poland, however, he didn’t want to go back to Bieszczady because, after living in Canada for 20 years, my dad had seen many different and greater mountains, more grand, wild, and wonderful than any he’d seen before. 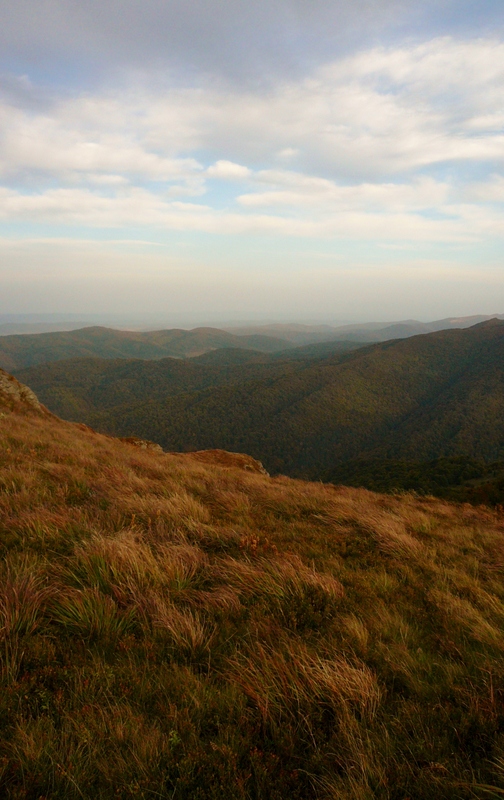 He didn’t want his memory of Bieszczady to be any less than it was. I think he’s slowly been changing his mind however. No matter what he’s seen, it’ll always be a special place for him. Before Dorothy and I left, he started telling us all about these mountains, and the trips him and his friends went on, the peace they found there. Now, I am waiting till he returns home (he’s in the middle of nowhere right now, working) so I can tell him that we went. I think next time he’s in Poland he will make a trip back. Anyways, enough family-related talk. The mountains are beautiful, but in a different way than the mountains where I come from are. They are covered in mainly deciduous trees of all colours, being autumn. Yellows, browns, golds, oranges, and all hues in between. The reds were just starting to happen. There is hill after hill of these colours. At the top, it is barren of trees, covered in shrubs and grasses. It’s incredibly windy, and the mountains appear more green than the colours viewed from the bottom. In the middle of summer, I’m told, they appear a true, vivid, Irish green though right now it was more of a faded colour. Though lower in elevation, they are widely spread out and barren at the top. I think Canada’s mountains are more jagged, wild, and weathered than these and greater in size. They are covered in mainly evergreens, or the scraggly kind of trees that you find on some mountain tops because of the decrease in oxygen. Or snow-topped, depending on the elevation. Still, the walk up was the same. Just as hard, and just as rewarding. My Aunty kept asking us if this was different than what we had in Canada. And in some ways, it was. The views, scenery, and atmosphere was different. But even if it was exactly the same, I would still enjoy it just as much. Because I don’t hike for the pleasure of seeking new things, hiking is the same routinely process. Back home, I hike the same mountains regularly. Because I love the feeling (the views, too, of course) but it’s mainly the journey. It never gets old. No matter how hard the hike, I enjoy bringing this challenge on myself, and the success I feel at the top. The five (more or less) hours that are entirely mine. Referring back to the different atmosphere, another big difference about these mountains was that you have to pay. You have to pay to hike. (How ridiculous is that?) You pay for the journey, to be able to see the beauty that was given to us from God. I think these mountains, among other places, should be open for everyone. It doesn’t feel right to have to pay. But they are a National Park of Poland. And an attraction to many. I can see in someone’s eyes, the profits he/she envisioned. And when you see money, why not? It’s a trap many fall into. We (we, being my aunt, my cousin, my sister, and I) hiked two mountain tops. There’s enough there to keep you busy for two weeks, my Aunt says, but we only had two days. The first day, starting at about 3pm because we arrived later in the day (had to drive a few hours to get there) we hiked the smallest mountain top. The next day, we hiked the one of highest elevation. I liked the buildup, the “warm-up” that was the first day. 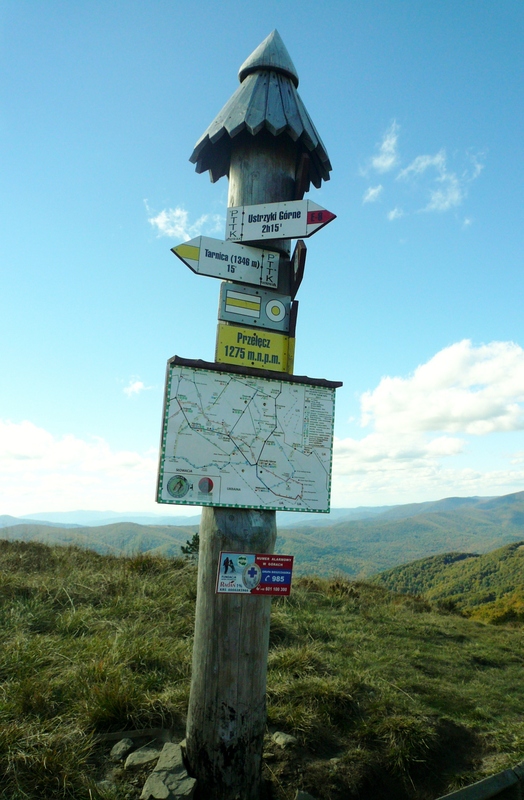 Here’s one of the many signposts, suggesting different routes you can take. After the first day, going to bed, I felt really happy. I’m not sure exactly what it was, but I’m glad to be here. And I am happy to be where I’m at. 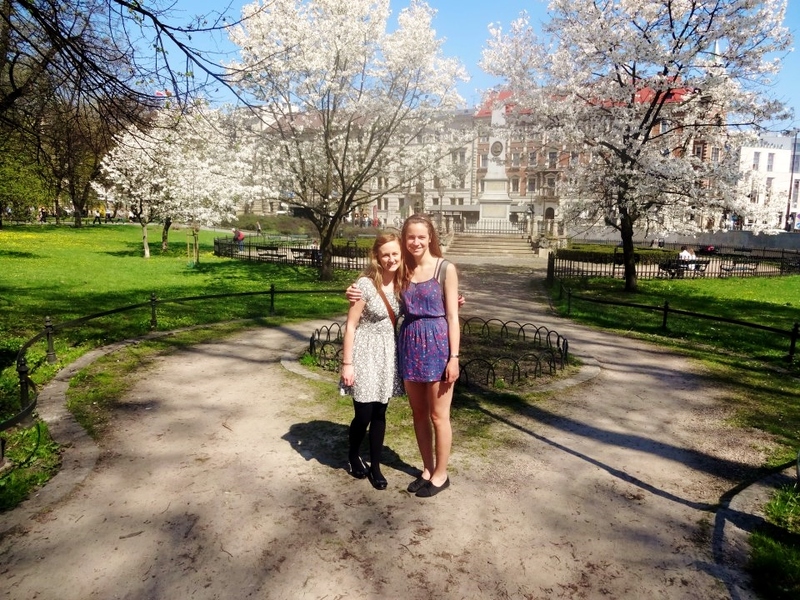 All my past choices, big and small, the decision to come to Poland, everything feels right. It was a really good feeling to have no regrets, about everything. To just be happy to be where I am. My Polish is improving daily. It feels so good. I know I still have a lot to go, every day the journey ahead seems to expand, but I’m feeling more confident. My thoughts are even becoming Polish. I may not speak as much as I used to, but my mind is working twice as hard. Words come to me that I may not have heard in years, and I learn new words that I may never have heard. School starts in less than a week. I can’t wait for the training in reading and writing because I feel that’s where I’m most lacking. I just can’t wait for a lot of things right now, actually. But I’m proud of myself for how far I’ve come; for throwing myself into this pool of the unknown and for wading through it. Things feel good. The atmosphere referring to the people. There were tons of people hiking. And they all held these mountains with such fascination. Back home, you are nearly alone when hiking. It is more isolated, more personal a journey. You are not saying “Dziendobry” or “Czesc” to every person you pass.